The perfect smile lights up a room and imbues its owner with an unmistakable confidence. However, it doesn’t take much to upset the balance of a perfect smile. If you suffer tooth loss, a gap in your smile will really stand out. You don’t want to feel self conscious in the wake of tooth loss. You need a solution that will help you feel confident in your pearly whites once again. You need a recovery option that is discreet and functional. Prosthetic dentistry options help repair broken smiles. It’s time to learn more about dental bridges, implants, and dentures. Forget the mental picture in your brain, dentures are far more than a clunky set of teeth that you pop into your mouth each morning. Dentures, and partial dentures, can address extensive tooth loss in your mouth while remaining an affordable option. 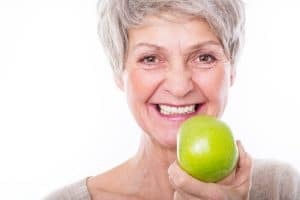 While dentures don’t have the same long-term stability that some other prosthetic options do, they’re the most efficient way to recover from significant tooth loss. If your tooth loss isn’t necessarily in sequence, your dentist can create a partial denture that fills in only the gaps you need. You may not need to recover from extensive tooth loss. If you suffer from an accident and you’ve had physical damage done to the teeth in a particular area in your mouth, you may need a tooth loss solution. Dental bridges are prosthetics made from replacement teeth (pontics) that are bound by dental crowns and set on either end of your missing teeth. This bridge can be removed relatively easily for cleaning and maintenance. The closest thing to a natural tooth replacement that you can find is a dental implant. That’s because implants are surgically placed in your jaw bone, like the roots of a tooth. This provides stability, long term, and can actually help stabilize your jawbone as well. Your dentist will use a dental crown to recreate the appearance of your tooth on top of the implant. When you need a dental prosthetic that will work for you, you need to work with a dentist who knows what they’re doing. Dr. Flynn has extensive training in prosthetic dentistry, and seeks to continue providing patients with advanced care where they need it most. Schedule a prosthetic consultation for your missing tooth by contacting Michael Flynn Dentistry in West Allis, WI at 414-541-8250.